Jane Yau is a well known DXN ganotherapist. Earlier she was a State Registered Nurse specialized in oncology, also she continued her studies in Nutritional Detoxification Therapy and Preventive Health and Nutrition at the University. She carry on her mission to create health awareness by telling people why they get sick, teaching people how to eat correctly and supporting with Ganotherapy to ensure super health. She visit Turkey together with her son William Gan. The tour started on 9. 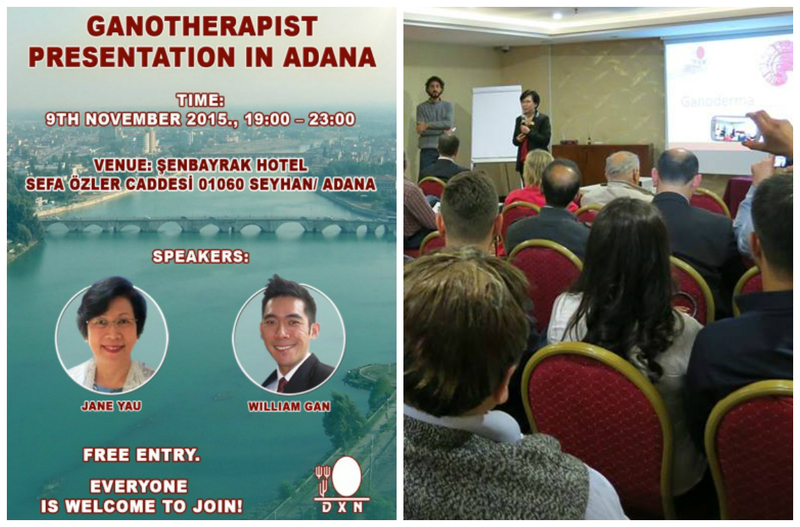 November 2015 in Adana, the next cities are Izmir, Antalya, Istanbul (European side), Bursa, Ankara and Istanbul (Asian side). 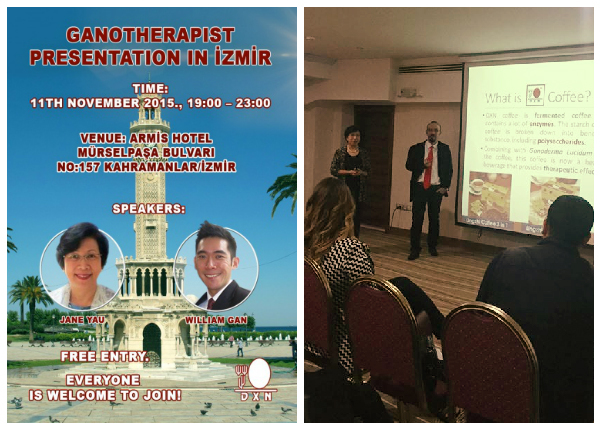 Ganotherapy, a preventive science that is based on Ganoderma – Reishi mushroom, is very popular in Asia and is now reaching recognition also in Europe and in Turkey as well. Reishi – the king of herbs, often called the mushroom of immortality. In ancient times this special mushroom was much more precious than gold. Very rare in natural environment, but since it has been produced on massive scale it is available for everyone. Free entry. Everybody is welcome to join! Do you live in Turkey? Do you speak Turkish? Or do you live somewhere else, but you have friends or relatives there? It’s also a great opportunity to send them information online, and you can build business together in Turkey. If you want to find a good online sponsor, you can join us from all over the world. 4. Fill out the form with your datas. 5. Send us a message – get in touch – so we can help you.